Here is a Gospel magic trick that teaches the truth that God is powerful! I am always on the lookout for science experiments that can be turned into a Gospel magic trick. I have found a lot of great experiments from Steve Spangler. His website is https://www.stevespanglerscience.com/ and if you are serious about incorporating GREAT Bible object lessons in your classes, you definitely want to check his site out. 3 plates/dishes 3 paper towels 1 bowl of water 3 pieces of paper 1 lighter/match 3 glass jars or glasses 3 pens or pencils. Completely wet one paper towel and press it flat down on the plate. Light the piece of paper and let it begin to burn. Place the paper inside the glass and immediately turn it over onto the papertowel. Let the flame burn out, then lift up the glass. 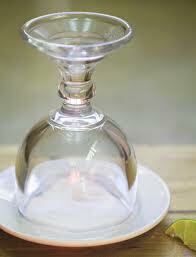 The glass will adhere to the paper towel and plate. There are so many wonderful things that we can do for God. We can pray that our friends and family members will come to know Him. We can help people out by giving them things that they might need like food or clothing or money. What are some other things we can do for God? (Wait for responses.) Yes. Those are all great ideas of things we can do for God. And our Bible verse says that ANYTHING we do for God will NEVER be wasted. There is another Bible verse that says "...when we are weak, God is strong." (2 Corinthians 12:10) So, even if we can only do little things for the Lord, God will still show Himself powerful to all who can see. I am now going to put the good deed in the pretty deed holder. I am going to turn this work for God over onto the plate, because I want to give to God all that I do for Him. The light is burning out, but don't worry, God is still at work. He has taken the good deed that you or I did and can show the world around us that He is strong and powerful! Now, what will happen if we don't give our good deeds over to the Lord? Instead our good works are just all about us. (Take a second plate and place the wet paper towel on it. Light a second piece of paper and place it in a second glass, but don't turn it over and try and lift the plate. Of course, it won't work.) Hmm. A Good work plus No connection to God and His Son Jesus equals no power. You see, when we don't do our good deeds for the Lord, God's power won't be able to shine through us. But if we give our good works to the Lord (Do the whole trick with the 3rd plate and so on...) then God's power will be seen by those around us and nothing we do for Him will ever be wasted. Are you living the egg-citing life of trust in God? Or do you think that life is just not all it's cracked up to be? Here is a fun Gospel magic trick that your kids will love. It takes some practice, but once you get the technique down, you and your kids will be glad you took the time to learn it. Place both containers on a tray or a table. I actually velcroed mine down so that they didn't fall when I pull out the pie tin. Have your carton of eggs nearby. Fill one of your containers with water about 3/4 full. Prepare a wooden cross with some red food coloring on the bottom. This will easily transfer to the water when you place the cross inside the container. Every time a person is involved in the story, you will balance an egg on the roll which stands on the pie tin. You will need to practice pulling the pie tin out from under the roll and egg, but you will get it after a few tries or so. Don't give up if it takes you a little longer. My kids really loved this trick. I have placed the words in blue below in the script to show when you should pull the pie tin each time. Picture yourself (hold up egg) standing (place egg sideways on top of the paper towel roll) on a rug (hold up the pie tin, then place it on top of the glass) and without you knowing it, someone yanks (pull the pie tin right out from under the roll and egg) the rug right out from under your feet and you fall flat like a cracked egg. The phrase “having the rug pulled out from under your feet” can be applied to any situation that catches you off guard. You just didn’t expect for that to happen. For example, you’re standing in line to buy popcorn at the movies and the person in front of you turns around too fast and bumps into you and dumps soda all over your nice new shirt! Ughh! You just didn’t expect that! Or maybe a friend promised to go to Disneyland with you but at the last minute they changed their mind. You can’t believe it! You’ve been planning to go to Disneyland for months! You just didn’t expect that! 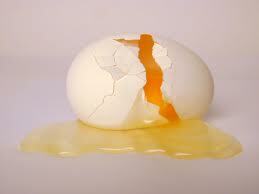 Un-eggs-pected things happen to all of us. It’s been going on since the beginning of time. Even to people in the Bible. Take David for egg-sample…Samuel the priest anointed him to be king of all Israel when he was only 16, but he really didn’t get to be king until he was much older. Instead he became eggs-hausted at running away from King Saul to save his life! Abraham became egg-cited when God told him he would be a father of many nations, but he didn’t egg-spect to have to wait so long. And Joseph was no egg-ception to surprises in his life. One day his brothers threw him into a well and left him there for dead! Yep. Sooner than later life has a way of pulling the rug out from all of us. Most people go through life thinking it is not all it is cracked it up to be. Egg-cept for those of us who have learned to trust in God! You see, I am a Christian. That means that I believe that God loves me so much that He gave His one and only Son Jesus to die for my sin. Jesus died on the cross (Hold of red cross) and shed His blood (Place cross with red food coloring into water) to forgive my sin. Sin is anything I think, anything I say or anything I do that displeases God. Because I believe that Jesus died for my sin, I am forgiven of my sin and I am now His child. Look! No cracks. God will always protect me. (Place egg on top of roll again.) I will still fall sometimes and life will throw me unexpected punches, (pull the tin) but God will always keep me safe when I trust in His everlasting arms of love. You see, David had to learn how to trust God too. Eventually he became king, but there were times in his life when he was knocked down, especially by family members. Even Jesus knew that He could trust God the Father when He had to endure the biggest knock down of His life by dying on the cross. So, what about you? Are you ready to trust God with your life? Life will throw you punches. It’s your choice to decide where you want to fall. Sharing this Christian poem for preschoolers about a happy pumpkin will delight your children during this holiday season! Coming up with a great Christian poem for preschoolers is one of my favorite things to do. If I can add my literary creation to a fun magic trick, then I have a winning combination! I LOVE sharing Gospel magic tricks with children of all ages and today's Christian poem for preschoolers uses a very easy trick that comes from BarryMitchellProducts.com. I had the honor of meeting Barry at the Magic Castle in Hollywood, CA this past year. He was fabulous! I loved all the tricks he showed and have been adding them to my own collection little by little. The trick shown in the video uses a trick that Barry calls his "Smile Maker." It's simple, fun and mistake proof. Any novice magician can master it in under a minute. During the "Halloween" season, Barry sells a "Pumpkin" version of the "Smile Maker." My version of this trick does require some extra preparation. I took fabric puffy paint and "drew" a face on each of the 8 small pumpkins to represent the expressions found below in the Christian poem for preschoolers. It worked really well, but go slow when squeezing out the paint and let it dry overnight. The last thing I needed for my trick was an empty plastic pumpkin that I bought at my local dollar store. Then, "Voila," I had a great trick ready to go! One day she was picked off the vine. She wondered where she'd go. Would she end up in pumpkin pie or in somebody's home? She really hoped someone would carve a face that matched her joy. Could she end up a Jack-o-lantern for a girl or boy? She pondered and she thought of different faces. Then she sighed. Then got sleepy and crawled inside an empty pumpkin that was nearby. She twirled around and swirled around and began to dream of faces. Of eyes and noses and of mouths all in different places. She thought of a face with a very sad frown. She didn't want a frown. That would make those who saw her feel down. She dreamed of a face that was very mad. That was not the face for her for today. She felt glad. She saw a face that looked confused like a person without God. She knew that wasn't the face for her for she loved God more than all. She saw a mouth that seemed scared and eyes that showed some fright. She didn't want that face. She wanted a face that showed God's light. She thought of a face that seemed real shy with little quiet pumpkin eyes. Sometimes she felt shy, but not today. She couldn't tell a lie. She dreamed of a sleeping pumpkin. Was that a snore she heard? She didn't want a tired face. She thought, "Oh my word!" She dreamed of a face with its mouth closed tight. That wasn't the face for her. She wanted a big ole smile, just right. She saw a face filled with worry and with stress. She wanted a face that showed she trusted in Jesus who is the very best. Finally, her nap was done. She remembered what she had dreamed. She crawled out of the empty pumpkin and on her face a smile beamed. She was a happy pumpkin. God heard her pumpkin heart. Now she would shine for Jesus to the end of October and from its start. "Let us throw off everything that hinders us and the sin that so easily entangles us an let us run with perseverance the race marked out for us."